Originally from Sacramento, Shayna started out as a competitive runner and triathlete from elementary through high school. In 2012, her senior year of high school, she decided to switch her focus from competing in multiple sports (track/cross country, triathlons, and cycling), to focusing solely on cross-country mountain biking. Through her four years of college, she competed in both road and mountain bike racing with the UCLA cycling team. She also raced with the BMC MTB Development team from 2012-2014 and the Liv Co-Factory MTB team from 2015-2016. The past couple years, Shayna switched her focus to road racing and gained valuable experience from racing in the pro peloton. 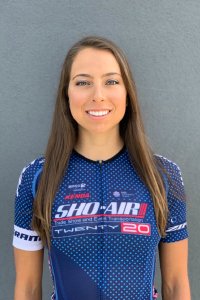 She plans to continue making road racing her primary focus in the upcoming years and is very excited to be joining Twenty20 for another year, a team she knows will help her accomplish her goals. Outside of cycling, Shayna enjoys spending time with her friends and family, which often includes road trips and various outdoor adventures. She also enjoys yoga, beach trips, and watching movies. Additionally, Shayna is passionate about mentoring and inspiring other women and young kids to stay healthy and active through biking. She even hosts community group ride events on Native American reservations a few times per year. My dad was a triathlete and cyclist who inspired my brother and I to start racing from a young age. My brother and I also inspired each other since there was always competition between us. Additionally, I’ve tried just about every sport and cycling was always the one I enjoyed the most. My parents and brother, who have gone far in athletics and life in general. We always inspire/encourage each other and lift each other up. Chicken with pesto, mozzarella, and tomatoes with sweet potatoes. I love how racing allows me to push my limits and go harder than I ever knew I could go. I also love how it allows me to meet new people and explore places I’ve never been before. My biggest accomplishment was winning the U23 Mountain Bike National Championship in 2013. It was my first year as a U23 and my first year racing professionally so I didn’t really know what to expect going in to the race. Luckily, the course suited my technical abilities and I came away with the win, defeating the defending National Champ. The feeling was unreal! I absolutely love racing in Missoula, Montana. There are mountains and trails everywhere, there is a river where you can surf and wakeboard, and the food and coffee is amazing. My other favorite place is Lake Tahoe because it is one of the most beautiful places I’ve ever been. Keeping it fun is most important. If it’s not fun there’s no point! Also, stay positive when it gets tough, and have an open mind that will allow you to notice and learn from mistakes. Hydration for me is so important. I always make sure I have water with me wherever I go so I can drink throughout the day. I also need lots of sleep, which is crucial for my body function properly both on and off the bike. If I wasn’t racing I’d be in a physical therapy graduate school program since my dream is to one day become a physical therapist. I’d spend 10 days in BC, Canada exploring towns such as Vancouver and Whistler since I’ve heard it’s absolutely beautiful there and the riding is amazing. I used to be really into horseback riding and even competed in a dressage show once! I usually just listen to Pandora radio on my phone. Typically, I’ll play hip-hop, electronic, pop, and alternative.